I've never really seen Phineas and Ferb before watching the DVD. Oh sure, it's been on TV in the background here and there so I've kinda seen a few half-episodes, but I never actually sat down and focused on the show. If the show is anything like what the episodes on this DVD represent, I've been missing out, because these are some funny episodes. Each half-hour show is broken up into two 15 minute episodes, and each episode tends to contain two stories, one featuring the brothers Phineas and Ferb and the other featuring the pet Platypus Perry. 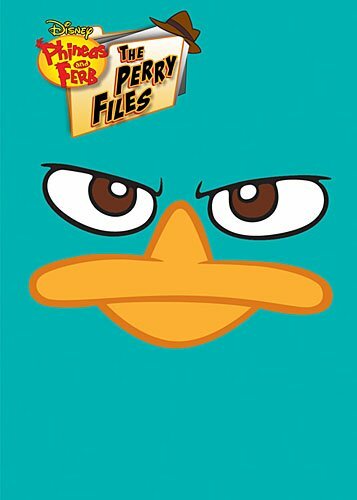 This DVD is called "The Perry Files", though the episodes all seem to be pretty evenly matched between Perry's story and Phineas and Ferb's. It makes me wonder if perhaps Perry isn't featured in many of the show's episodes, or at least has significantly less screen time. So Pheneas and Ferb are two brothers who everyday trying to find something to do, and this something always involves some elaboarte genius invention that the pair can think up and build in no time. Their sister, Candace, is often witness to these grand projects and for some reason desperately wants them to get in trouble for it. The running gag is that no matter how huge the project is, it always somehow disappears immediately before Candace is able to get her mom to look at where it had just been. She calls it trying to "bust" them, like they're doing something wrong, but I think their mom would actually be very pleased to see the amazing stuff they come up with. It doesn't make much sense, but it's funny, so it doesn't really have to. While the brothers are doing their thing, their pet platypus Perry is summoned to his secret headquarters where he dons his hat becoming secret Agent P. Agent P is then given a mission to foil the plot of Dr. Heinz Doofenshmirtz, aka Doof. Usually Agent P is able to stop Doof's evil scheme, yet sometimes Doof does it himself, such as in the first episode on this disc where Agent P is busy so Doof uses a potted plant as a stand in for Perry and he accidentally causes the plant to foil his plan. It all plays out much better than I can explain it, just know that it's definitely funny. Perry doesn't speak (other than this one sound effect), so a lot of his attitude comes from his eyes, thus it's fitting that the slipcover for this DVD release has Perry's eyes move back and forth when you move it back and forth. Oh yeah, I almost forgot, every episode contains a musical number, and most have some pretty funny lyrics (I say most because there were a couple which I couldn't understand what they were say... though I assume they would have been funny as well). This 2-disc release comes with one DVD and one digital copy, plus an "activity pack" which is like a foldout background scene plus stickers, magnets, jigsaw puzzle and a postcard. The DVD contains a couple of bonus features, Nerves of Teal and Platybus Tour. The Platybus Tour featurette was short, at only 2 minutes, but it was interesting to see how they got the bus made up to look like Perry. Nerves of Teal is also only two minutes and is made up to be like a recruitment video for the agency that Perry works for. It's was okay, nothing really special. But the episodes are good so it's worth checking out.